In this episode, we’re going to put the LCT 240 to the test! 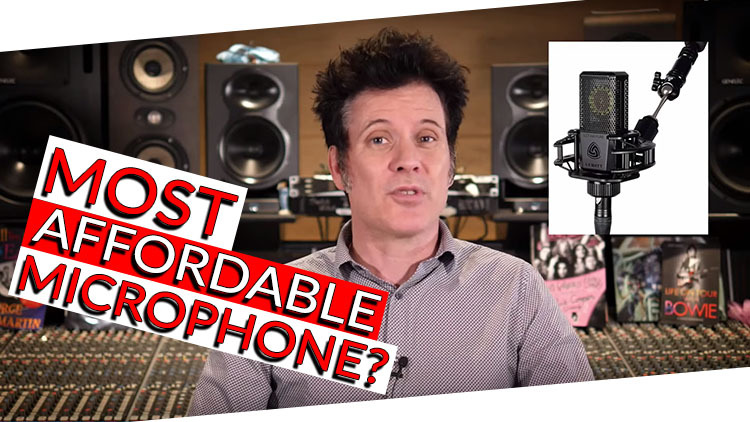 At only $149 it’s extremely affordable- The best thing about this mic is that we’re going to be giving one away! Enter to win above! I recently recorded an entire album with The Workday Release mainly using the Lewitt LCT 440 Pure, which is only $269. I’m going to be using the LCT 240 in a few different scenarios today and we’re using the very affordable Audient ID4 interface! This mic has no variable polar patterns, no high pass filter, no roll off- it’s essentially a microphone for all occasions. 99% of my time I never get out of cardioid. You can use microphones in figure 8 and omni to pick up from the back and all around, but most of the time I’m not doing that. I’m just going to face it towards me and record myself playing and singing – this should be interesting, to say the least. I’m a little bit away from the microphone so there’s probably going to be a lot of ambient noise in here- it’s not ideal but it’s good enough to showcase what it does. Immediately it’s interesting- there are very few times where I would record acoustic and vocal like this except in a live filming situation. I would definitely want to be somewhere quieter without the lights and fans. The Lewitt 240 is pretty responsive, there’s something to be said for having a mic backed off quite away! As you can see in the video below, I’ve got it somewhere halfway between my vocals and the sound hole- it’s somewhere in the middle. I’m not the world’s greatest singer or acoustic guitar player, but that’s kinda the point. I set up the 240 around the 12th-14th fret and we tried it out with just the guitar- I really liked it so I figured we should track a song using just one mic! The point is there are no limitations anymore! It’s all about your creativity. Thank you ever so much to our friends over at Lewitt for giving us a mic to Giveaway! Read more about the Lewitt LCT 240 PRO. The LCT 240 PRO is an extremely versatile cardioid condenser microphone designed for everyone who’s eager to take the next step in professional recording. Equipped with a high-performance condenser capsule it enables clean, modern, and detailed recordings. To accomplish an intimate and direct sound, especially on vocals, we have added a boost for the airy frequencies. The sturdy, compact and streamlined housing comes in chilly white and classic black. Be prepared for fantastic results on vocals, acoustic instruments, amplifiers, drums, piano, … – at home, in the studio, and on stage – fast and uncomplicated.